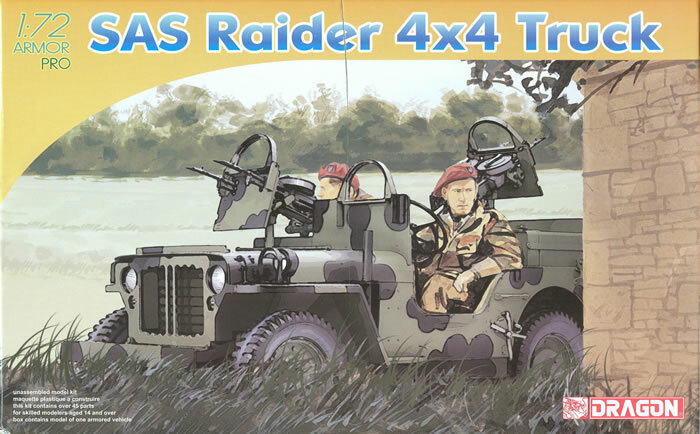 DML has followed up on its 1/35 scale Willys Jeep kits with a new one in 1/72 scale that highlights the British scout vehicles used in Northwest Europe. This follows the pattern of the larger kits and is nicely done with a lot of parts for this scale. The entire chassis is separate but the springs are molded integral with the frame. The running gear consists of one piece with a separate muffler/skid plate assembly. But the wheels do not look right and apparently some of the problems with shape found on the larger scale kits have found their way into this one. However, they appear to be the only major flaw in the kit. While it does not come with any stock Jeep parts such as the windshield (top bows are included for other versions later on) it comes with a full interior and the modifications that include twin extra fuel tanks in the passenger compartment and a rack of “flimsies” on the rear of the vehicle. The interior does include the shifter and 2/4//transfer case assembly levers plus a nicely detailed dashboard. The model comes with a number of weapons, specifically no less than six Vickers K machine guns and a Bren gun on a swivel mount. Three armored glass windscreens are provided as well. The sole finishing option for the kit is a “Mickey Mouse” black over olive drab scheme with no markings. No decals are provided. Overall this is a nice little model of a Jeep and finally brings 1/35 scale molding quality to 1/72 Jeeps.